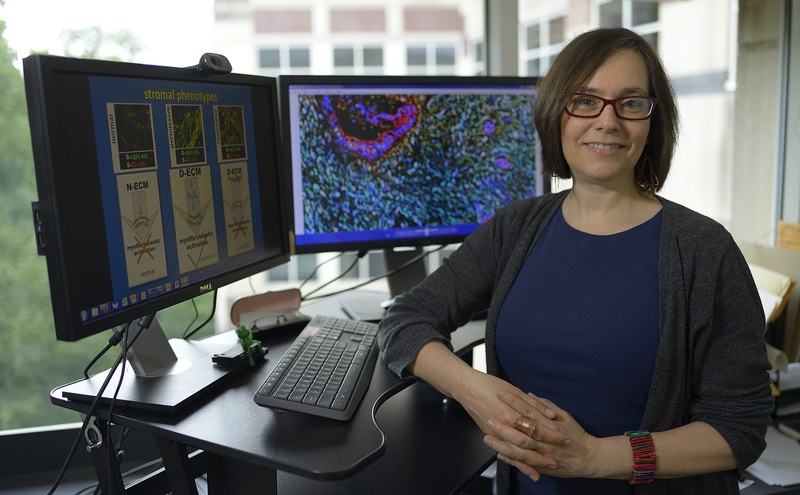 Dr. Edna Cukierman, associate professor and co-director of the new Marvin and Concetta Greenberg Pancreatic Cancer Institute at Fox Chase Cancer Center, spoke with us about plans for this new world class research institute. How did you become interested in pancreatic cancer research? Pancreatic cancer is a difficult disease that needs attention. I was originally trained as a biochemist and cell biologist, outside the field of cancer. I knew there were cells residing in the same neighborhood as cancer cells that somehow accompanied them, but were not cancerous. I thought I could focus on the neighborhood around pancreatic tumors rather than jumping right into the mainstream of cancer research. Little did I know that the tumor microenvironment is a huge field! You have lived all around the world. What brought you to Fox Chase Cancer Center? I was born in Mexico City and did my undergraduate and graduate work in Israel; my husband grew up there and both of my children were born in Israel. For my post-doctoral work, I accepted a position at the National Institutes of Health in Bethesda, MD. My husband and I had planned to search for positions without any particular local restriction as we became curious about opportunities in the US, in part because my family was settled and happy here. Fox Chase Cancer Center had a position open. When I came for an interview the vibe here was so invigorating we decided to stay. That was 15 years ago! What do you like best about working at Fox Chase? The people! You feel the camaraderie as soon as you walk in—everyone knows each other. Scientists and physicians co-exist in a way you don’t see at other institutions. We all like being here and the enjoyment is contagious. Can you tell us about the new Marvin and Concetta Greenberg Pancreatic Cancer Institute at Fox Chase Cancer Center? It will be a very multidisciplinary place, which is different from other institutions and critical to our research. I cannot do my research without talking to physicians, surgeons, and population scientists regularly. We need a fresh and different look at this disease to attack it better. The beautiful gift from Mrs. Greenberg lets us harness all of these disciplines for the same goal: a better understanding of the disease. How will the new Institute help patients? It will be a clinic and a research center. An immediate goal is to affect positive change for pancreatic cancer patients and their families. Every patient will have a Fox Chase “navigator” to accompany them throughout each procedure, each day, for their entire illness. The navigator will also keep a log of the patient’s clinical and behavioral characteristics—what they eat, if they exercise, how they feel, how their caretakers feel, etc. We want to look at how behavior and cancer therapy interact. The goal is to combine all of this data with information from national and international databases, and bring our findings back here to help our patients. Our patients are so important to us—we could not do our research without their help. The patients themselves help advance treatment for pancreatic cancer by allowing us to evaluate their blood and recreate what goes on in their bodies using tiny pieces of tumor removed during surgery or during routine acquisition of biopsies. We consider that by better mimicking the patient’s tumors and their accompanying non-cancerous components we will uncover new therapeutic targets to facilitate the future development of novel drugs. Thus, we want to learn from every patient who comes to Fox Chase Cancer Center so we can serve patients better now and in the future. Why is it important to have a dedicated pancreatic cancer institute? The pancreas is very different from other organs and its response to cancer is different. The neighborhood cells that accompany the cancer are very prominent in pancreatic cancer. We want to interfere with the way the neighborhood promotes the development and progression of cancer. We hope to use the natural tumor protection the pancreas loses when cancer develops. We will also focus on prevention and early detection. My co-director, Dr. Igor Astsaturov, is leading efforts to understand how pancreatic tumors continue to get essential nutrients once they lose their blood supply. Other cancers maintain a blood supply, but this supply is limited in pancreatic cancer. Somehow pancreatic cancer remains able to cut off the patient’s anti-tumor immune system and still get food. We want to understand this puzzle, to turn the immune system back on and stop the specialized food supply to cancer cells. What do you do when you aren't at work? I greatly enjoy solving mind-puzzles and games. Also, my husband and I have always prized spending time with our two kids. We are empty-nesters now, and enjoy their adult company as well as each other’s. We love traveling. Last year we went to China and were mesmerized by the culture and the food. Science is very international so we now have increased opportunities to travel together. Find out more about The Marvin and Concetta Greenberg Pancreatic Cancer Institute.